The AC "Cobra" is probably the most copied sportscar the world has ever seen. The model name is often applied to imitators and has almost become a generic name for Anglo/American open roadsters, featuring larger than life engines. 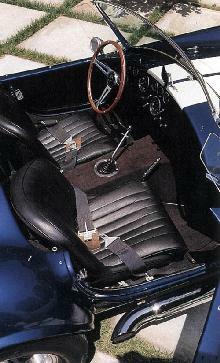 The original AC Cobra 260 appeared in 1962 and was the result of a partnership between AC and the mighty Ford Motor Co. The Cobra 260 used a modified Ace body and chassis which was married to a 260 cubic inch ( 4261cc ) Ford V8, which produced an incredible amount of BHP and torque. The Cobra used disc brakes and an antiquated cam-and -peg steering box, performance was mid blowing for its time! 7' 6" 4' 4" 4' 4" 12' 7" 5' 1" 0 (18) 0' 0"